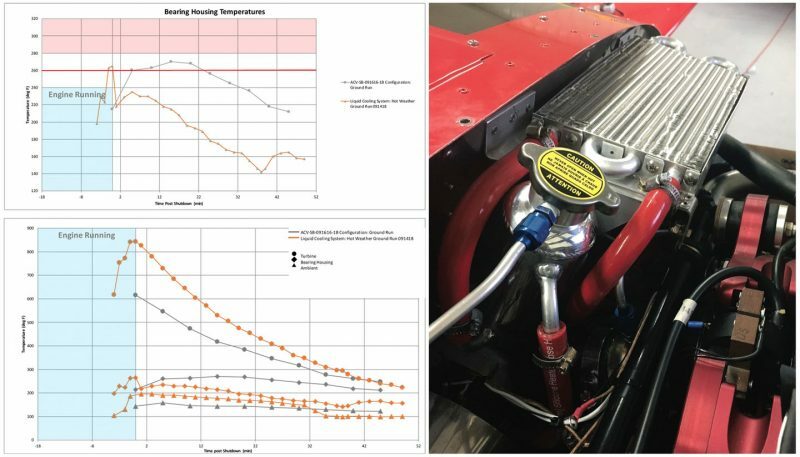 Max Bearing Block Temperature: allowed to reach 265 degrees F during run before cooling system switched on immediately after engine shut-down. 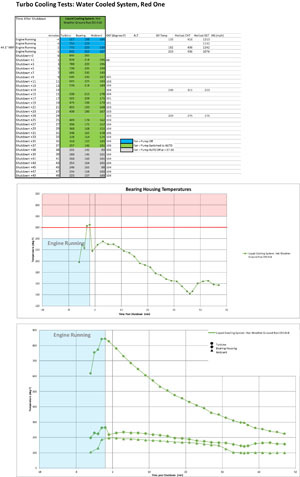 Bearing Block Temperature at Shutdown +1 minute: 218 degrees F (47 degree drop in temp after cooling system enabled). Max Bearing Block Temperature during cool-down: 235 degrees F at Shutdown + 5 minutes. Cooling System Thermostat Auto Shut-Off: Shutdown + 37:30 minutes (Bearing Block at 142 degrees F). 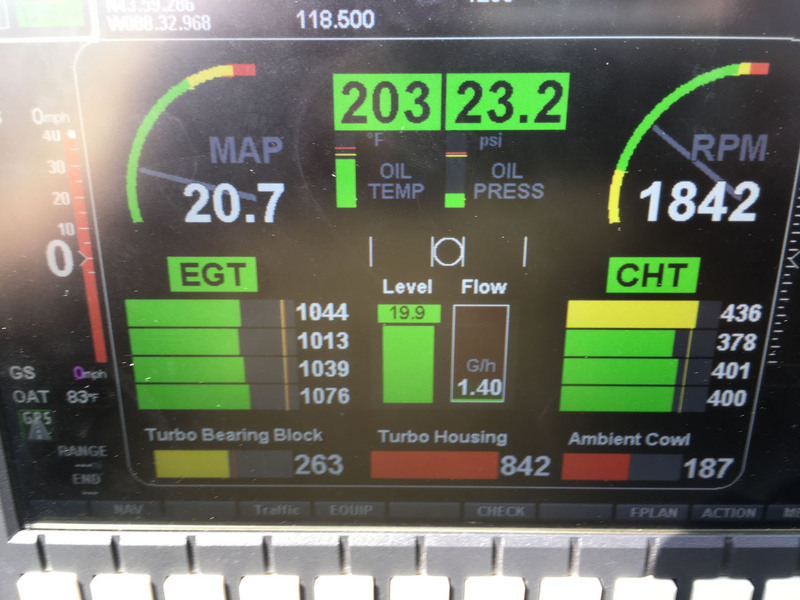 Max Bearing Block Temperature after Cooling System Shut-Off: 165 degrees F at Shutdown + 45 minutes (4:30 minutes after Cooling System Shut-Off). Hot Weather Ground Run Test conducted on September 14th exposed the system to the most challenging conditions yet. Comparison of the latest Liquid Cooled system test vs. the Air Cooled system. The Liquid Cooled system offers superior performance even in harsher conditions. 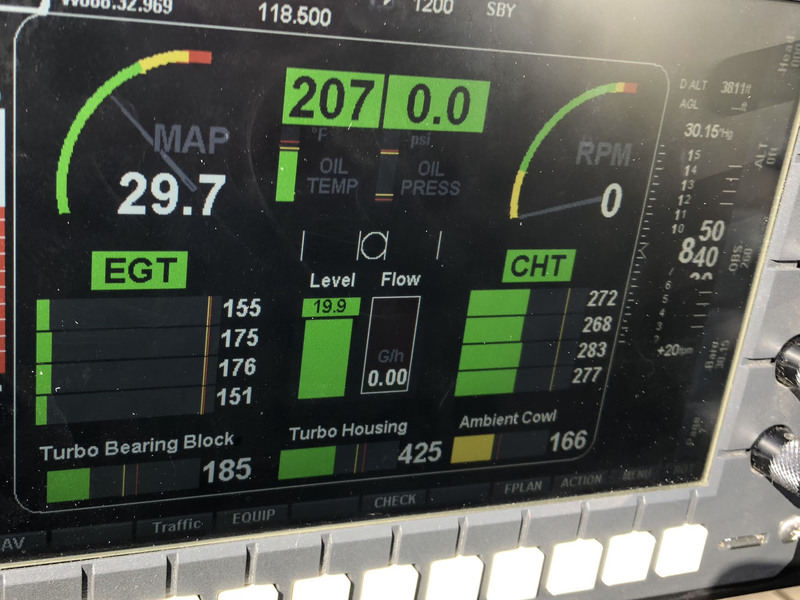 Engine and Turbo temperatures one minute before shutting the engine down from an abusive engine ground run test. Don’t try this at home! Turbo Temperatures at Shutdown, just prior to switching-on the Liquid Cooling system. This represents the hottest turbo temperatures we have induced to-date in testing. Turbo Temperatures at Shutdown + 24:45 minutes with Liquid Cooling System running. While flights may be conducted by customers in hotter ambient conditions in other parts of the world, our experience with flight testing shows that in-flight conditions with normal airflow through the cowling yield significantly cooler temperatures system-wide than hard ground running. Further, the traffic pattern, approach and landing phase of flight allows some natural system cooling time with lower engine RPM. 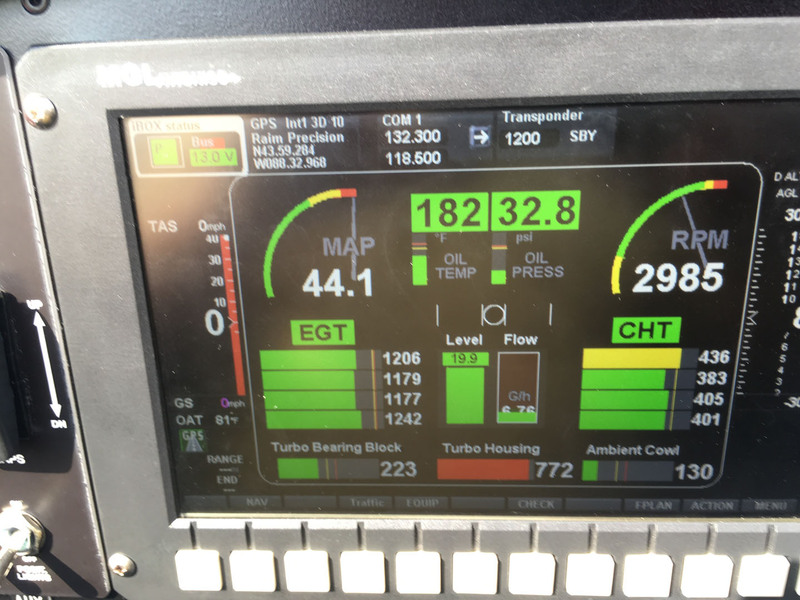 This newest ground run test data successfully proves the system’s performance in extreme conditions. 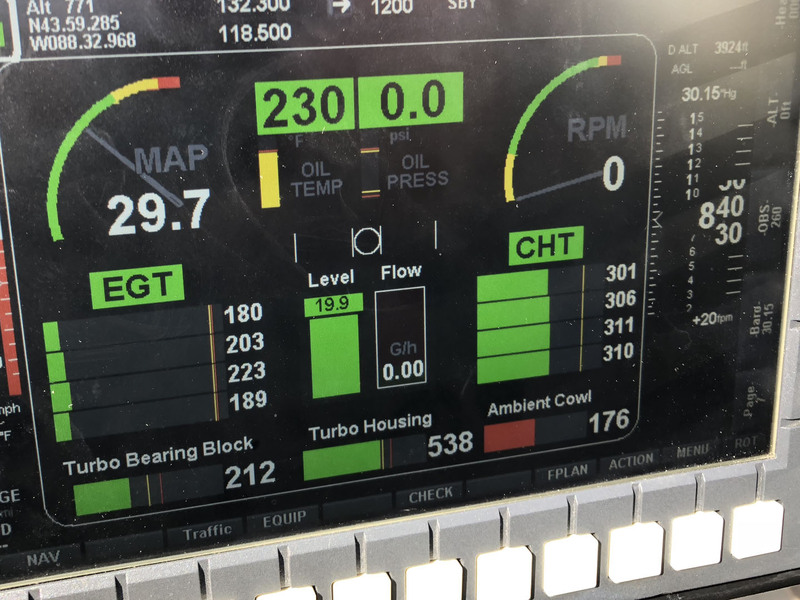 Enabling the cooling system upon exiting the active runway after landing has continued to work well for Sonex Aircraft. 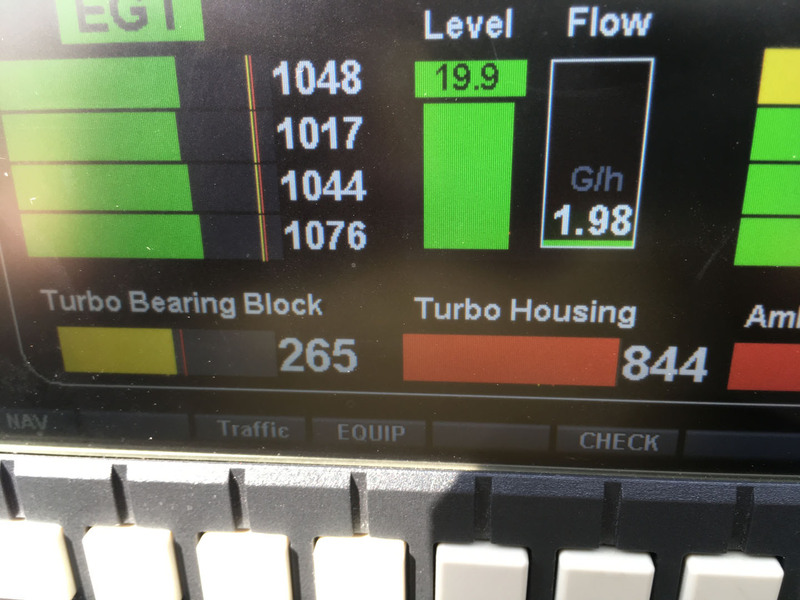 Customers may vary that procedure as-needed in hotter climates, possibly running the system in-flight, however, the rate of oil flow through the turbocharger in-flight has done a great job of controlling bearing block temperatures in our experience.